Duration: variable, thought 120 min. 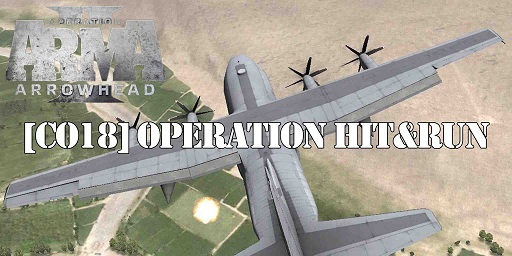 Operation Hit & Run is a cooperative multiplayer mission. the primary objective is to find and liquidate an enemy Colonel. The number of enemies will adapt to the number of players currently on the server located in front of each new mission objective and is therefore very dynamic. *Rain, Wind&Weathersynchronicity with all Clients. *Villa and Hideout in Zargabad are now indestructible. *Parameter Respawnbutton appears after x seconds added. *Used newest version of norrin’s Revive v0.50. *Used newest version of Lurchi’s AC130 v0.6. *Number of enemys greatly reduced. *All kinds of JIP faults fixed. *Small changes in the Missionprogress.